Your basement serves one of two purposes in your house. Either you completely forget it’s there and you use it rarely, or the basement contains an entirely new level of living for your family thanks to a few bedrooms, den, bathroom and maybe even a partial kitchen. No matter how you use your basement, there is one key when you add flooring to the lowest level of your house. You have to keep moisture out of that space. 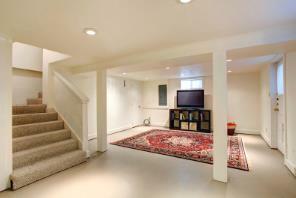 Take into account these aspects for choosing an appropriate flooring for your basement. When it comes to designing a floor, you must pay special attention to basements due to the moisture factor. Have a professional inspect your basement for a few problems before an installer comes to your home to place the floor. Does your basement have water seep into on a regular basis? Think about when spring rain storms turn your yard into a small stream. Does water infiltrate your basement at those times? A professional foundation expert should remedy that problem first. The contractor can inspect your foundation for any cracks or crevices that could allow water to enter your basement. You can’t put a floor down when you have water problems because the moisture simply ruins your living space. Condensation is another thing to watch out for in a basement. That’s because this level of the house sits below ground where it’s cooler. Warmer, moister air can come in contact with cooler concrete surfaces or slab floors to form water droplets. You must learn to keep that condensation at bay during all times of year for your flooring to work well for you. Invest in a whole-home dehumidifier that attaches to your HVAC system. This keeps condensation out of your basement at all times. Your home builder should have already installed vapor barriers in between the walls and floors and the ground outside of your house. After getting rid of moisture, keep the area dry and clean from that moment onward. Then it’s time to start planning your floor! Before someone installs the basement floor, it must be level. A flooring pro fixes any cracks in the existing floor and determines the best type of subfloor for your basement. Your floor pro should suggest a sturdy subfloor, or the floor that goes underneath the floor you actually see, from something called tile backerboard. This substance comes in cement or fiber-reinforced gypsum (similar to sheet rock). This subfloor attaches to your cement slab with special screws, nails or glue to it stays secure. Once your basement has a subfloor, your installer places the actual floor on top of that. You have a wide range of suitable materials for basement flooring even though you may run into difficulties with moisture. Thanks to modern manufacturing and precision engineering, you can get a great deal on fantastic flooring for your basement. Carpeting represents a steady choice. As many as 28 percent of all new homes have carpeting installed in the basement. Carpeting serves as an insulating layer that keeps out the cooler temperatures of the ground, especially during winter time. Carpets, especially with a pad underneath, also absorb sound that otherwise would bounce off of a concrete slab. Lower-style carpets made of synthetic fibers hold up to wear and tear the best to give your basement floor years of good use. Go for neutral colors of carpet throughout the basement. This gives you more options if you want to repaint the walls later. Thanks to modern manufacturing, there are tons of beautiful options for ceramic tile on a basement floor. The backs of ceramic tile easily adhere to the subfloor, so installers shouldn’t have any problems with this flooring choice. Ceramic tile is durable, lasts for decades and stands up to just about anything except for having a heavy weight dropped on it. If one or two tiles crack, you can replace them one at a time instead of having to get an entire room full of new carpet. The downside is that ceramic tile stays cooler than carpets, but you can remedy that with an area rug or socks. Vinyl represents the middle ground between carpeting and ceramic tile. Vinyl comes in tons of styles and colors, and it also adheres to the subfloor easily. Make sure the subfloor is very smooth as imperfections and bumps in the concrete floor can damage vinyl flooring. 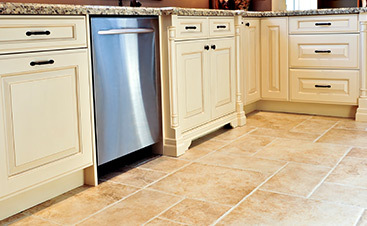 As with ceramic tile, you can replace a section of vinyl flooring without having to take up the entire floor. Vinyl isn’t as cold as ceramic tile, so you have a halfway decent level of insulation. Your installer may recommend thicker, industrial-grade vinyl flooring to mitigate the bumps in the concrete slab. 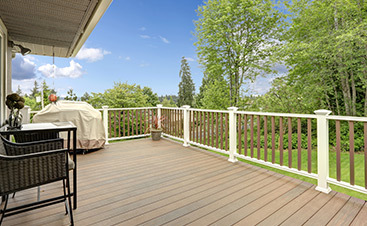 Laminate is similar to ceramic tile in terms of toughness and workmanship. It mimics the look of wood, ceramic and stone. Manufacturers create laminate to resist moisture, so this is an obvious choice for your high-traffic basement flooring needs. If your basement has moisture difficulties, avoid wood. 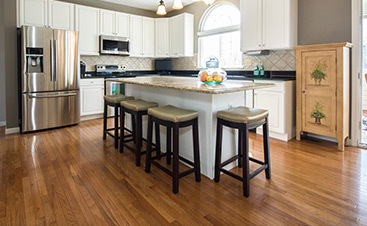 Water warps wood, and over time your floors can slowly rot, even if you have treated wood on your floors. Concrete floors are an option, but paint that covers the concrete may rub off over time with wear. The lowest-maintenance flooring for your basement should come from carpets, ceramic tile, vinyl or laminate. The pros at Flortec specialize in wood flooring installation services, but we can install any types of floors in your home. We will design the look you want, match colors and show you what your final room looks like with our products in your house. We have great relationships with several manufacturers, so let our designers and installers can help to increase the usability and value of your home with a beautiful basement floor.